Want a quick look at what you're about to download? Click the links below. Our user interface is so easy to understand it practically shows you how to clean your computer. 'Active Clean' runs in the background and fixes registry errors in real-time - so your PC is always up to speed. SafeDelete™, our unique failsafe feature, makes accidental deletions a thing of the past. Comodo offers a range of tightly integrated security and productivity software. Great value, too! Default Deny Protection slams the door on viruses and protects you from online threats. Includes subscription to GeekBuddy support services and $500 virus free guarantee. 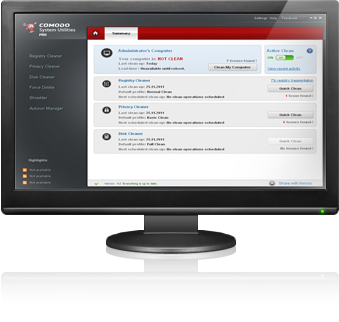 Comodo ONE is an integrated IT management platform that reduces costs by combining all the capabilities you need to optimize your MSP business including Remote Monitoring and Management, Service Desk and Patch Management. Comodo Dome internet security-as-a-service addresses malware at the network level for organizations of all sizes—protecting every user and every device at any location.